Five British teams played their second leg ties in the UEFA Cup last night with four of them managing to make it through to the last 16 of Europeâ€™s secondary competition. Spurs started brightly but then stuttered towards the end and Sparta Prague could have taken the tie into extra time had the returning Paul Robinson not pulled off a world class save â€“ Can Robbo make it back to being Englandâ€™s No.1? Everton claimed the most impressive scoreline with a 6-1 victory over Swiss minnows Brann. 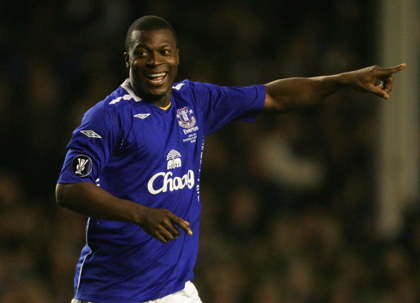 Yakubu scored the second Everton hat trick of his career â€“ Does that mean heâ€™s done enough for David Moyes to forgive him after he recently went AWOL in Africa? Click through for a look at the other results and the draw for the last 16. Boltonâ€™s scoreless draw against Athletico Madrid, a team in the top four of La Liga, was probably the most surprising result. With the club still struggling for Premier League form but excelling in Europe â€“ Is Gary Megson the ginger Rafa Benitez? Rangers are still dreaming of doing the quadruple after an away goal in Greece saw them advance with a late away goal from Nacho Novos â€“ How many trophies do you think the Scots will eventually win this season? The only British team that couldnâ€™t reach the last 16 was poor Aberdeen who were stuffed by Bayern Munich going went out 7-3 on aggregate â€“ Can anyone see past the Germans as the eventual winners of this competition?